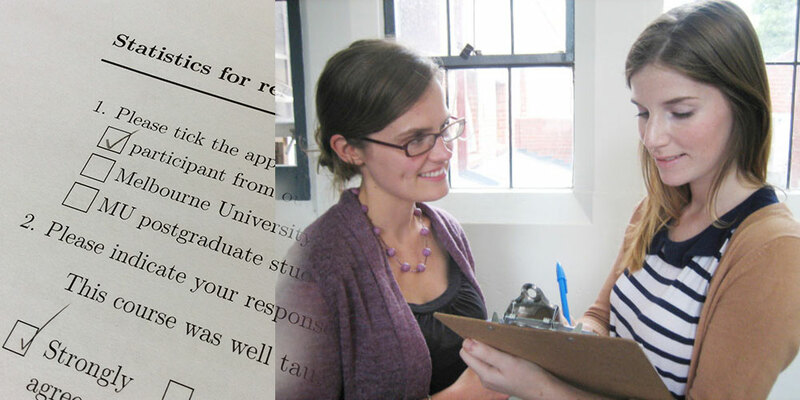 Survey methods: face-to-face interviews; on-line surveys; phone interviews; paper questionnaires. Questionnaire design: open and closed questions; wording and ordering; layout and length of questionnaire; memory and recall; sensitive questions; pilot testing. Measurement: types of data; Likert scales; reliability. Sampling methods: simple random sampling; stratified sampling; systematic sampling; cluster sampling; multi-stage sampling; non-probability methods. Estimation of population means, totals and proportions. Cross-tabulation and analysis of survey data. The presenter is Associate Professor Graham Hepworth, Deputy Director of the Statistical Consulting Centre. Graham has had extensive experience over three decades in the area of design and analysis of surveys, in fields such as medicine, the social sciences, education and agriculture. Each of the three days will consist of four approximately equal-length sessions; the first session of the day will commence at 9:00 a.m. and the final session will end at approximately 4.45 pm. The sessions will mix lecture presentations with practical work; tutorial help will be available. A certificate will be provided on completion. All participants will have access to a PC. The statistical package SPSS will be used in the course. The cost of the course is $880(incl. $80 GST). The fee includes a comprehensive set of notes, and morning and afternoon tea. Lunches are not provided.